Travelling can be thirsty work, so we decided to have a look at some of the best travel bottles on the market. Obviously, travelling by air these days makes carrying a water bottle in your hand luggage a no-no, so do bear that in mind – pack the travel bottle in your luggage, empty, or leave it for domestic travel or for journeys by sea, rail or road. 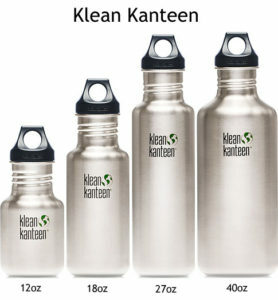 Kleen Kanteen offers an alternative to the plastic products that proliferate modern society. With worries about BPA and other chemicals contaminating drinks, people are looking for alternatives: this sturdy yet attractive stainless steel bottle answers this demand. It is available in a range of bright colours or plain silvery steel. This bottle comes with two caps: one, a sports cap that makes it easy to use on the go, the other a tough screw cap. The mouth of the bottle is wide enough to make cleaning easy and will also allow ice cubes to be dropped in to keep the drink even colder. These large bottles hold an impressive 18 fluid ounces, which equates to 533 millilitres. One of our testers has a fondness for lengthy rambling hikes and he leapt at the chance to try out a new water bottle. He admitted that he usually just takes a disposable bottle with him, but was drawn to the sleek lines and attractive promises of the product. He took it home with him and set off for a three-day hiking and camping trip. He tried the sports cap first, and found that the flow of the drink is just right: there is no need to strain to get a drink, nor does the liquid flood out and choke the user. However, he did find that the sports cap has a tendency to leak. Once he changed to the screw cap, the leaks stopped and he preferred that option, even though it took a little longer to have a sip of water. Comfort: 90%. The bottle is large and quite smooth which can make it slippery when it is full and the user is a little sweaty. Otherwise it is easy to fit into a backpack side pocket, and is easy to use. Safety: 100%. 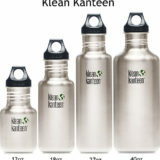 The bottle is easy to keep clean and hygienic and being made from stainless steel ensures that there is no possibility for chemicals and contaminants to leach into the drink it contains. Value for Money: 90%. At £14.00 there is no way to claim that this is a cheap bottle. However, being made from steel, it is sturdy and durable, sure to last a long time. As a one-off purchase, not to be used often, it is probably not the best buy, but for someone looking for a bottle that they will carry everywhere (and hopefully not lose! ), it is a good bargain, despite the hefty price tag.